Deep-fry potstickers straight from the freezer. Potstickers, those tasty, hand-made Chinese dumplings, generally feature pork, beef, chicken or cooked vegetables enclosed inside bite-sized pockets of dough. Pick up the snack or appetizer in the frozen food section of most grocery stores and cook them up at home. 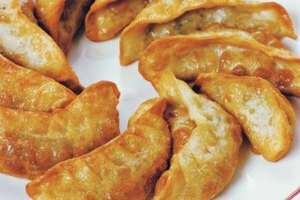 Although typically steamed or pan-friend, you can deep-fry frozen potstickers to a crispy, golden brown perfection. Add cooking oil to a deep pot with high sides. Add enough oil that will allow the potstickers to be fully submerged in it. Or use a deep fryer if you have one. Heat the oil on the stove to 375 degrees Fahrenheit. If you are using a pot, stick a candy thermometer in the oil to make sure it gets to the correct temperature. Use a metal slotted spoon to carefully lower the frozen potstickers into the hot oil. Allow them to cook for three to five minutes, until they are golden brown and crispy. Don't overcrowd the pot; cook the potstickers in batches if necessary. Remove the potstickers from the hot oil with the slotted spoon and place them on a paper towel-lined plate to drain and cool before serving. Take extra care when dealing with a large amount of hot oil to avoid splatters and burns. Lower the heat if the oil is splattering and smoking too much.